Pepper's Cone is a simple 3D display that can be built from a tablet computer and a plastic sheet folded into a cone. 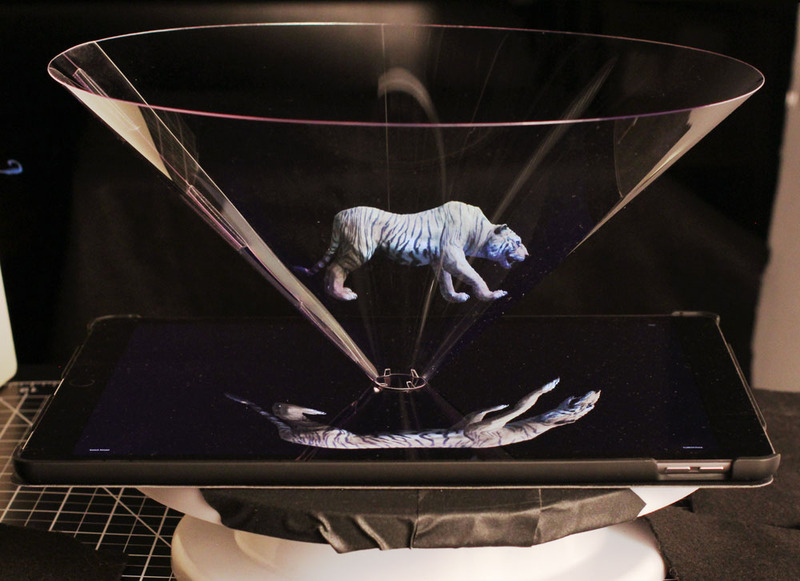 By rotating the tablet about the y-axis, a user can view 3D objects naturally over 360 degrees without special glasses. The transparent conical surface reflects the image displayed on the 2D screen. The displayed image is pre-distorted, so its reflection appears to be perspective-correct and suspended inside the reflector. Using the tablet's integrated gyroscope, the viewer adjusts the rendered image based on their relative orientation. Pepper's Cone: An inexpensive do-it-yourself 3D display.